There's no denying that the Ultimate Star's skin seems to be glowing nowadays. Well, Jennylyn Mercado finally revealed her beauty secret! In an Instagram post, The Pinay Steffi claims that 'Jinju White' is the best whitening soap that she has tried and she's loving it. You'll really see the difference in just 14 days of use. Visit the social media accounts of 'Jinju White' to order. 'Jinju White' is also available at Pretty Looks branches nationwide. Get yours now! LOOK: 'My Love From The Star' lead stars Jennylyn Mercado and Gil Cuerva brings 'kilig' to Kapusos in Gensan! The lead stars of the much awaited remake of the hit Korean drama series My Love From The Star, Jennylyn Mercado and Gil Cuerva brought 'kilig' to their fans at their mall show at KCC Mall of Gensan. The crowd cheered on for the Pinoy Steffi and Matteo as they serenaded their fans. The new Kapuso love team also invited everyone to watch our for their show which will premiere soon on GMA Telebabad. Things just got more exciting for the highly anticipated remake of My Love From The Star as Rhian Ramos joins forces with Jackie Rice as Ultimate Star Jennylyn Mercado's rivals. Jackie Rice, as previously reported will play the role of Lucy while Rhian Ramos is said to portray the role of Rachel. Will they succeed in bringing down the country's No. 1 celebrity, Steffi? Watch your back Jennylyn! Other stars who are also part of the Pinoy adaptation of this hit Korean drama include male lead Gil Cuerva, Christian Bautista, Gabby Eigenmann, Glydel Mercado, Melissa Mendez, Miggo Adecer, Nar Cabico, Renz Fernandez, Valentin, Moi Bien. Directed by the one and only Bb. Joyce Bernal. LOOK: Bret Jackson, elated with Jennylyn Mercado's Twitter response to his Valentines Day greeting! Teen heartthrob Bret Jackson was trilled with Ultimate Star Jennylyn Mercado's Twitter reply to his Valentines Day greeting for the Kapuso actress. Bret described that moment as his "Best Valentines Day Ever" as he posted a screenshot of his celebrity crush's reply on his Instagram account. Check out his post below. Lucky you Bret! WATCH: Jennylyn Mercado puts her own spin to an Adele hit song! Since the 2017 Grammy's fever is still on and as a tribute to the most awarded artist of that night, music superstar Adele, we thought we'd bring back Jennylyn Mercado's beautiful and funny version of the multi Grammy winner's hit song "All I Ask". As of this writing, the Ultimate Star's videos have garnered hundreds and thousands of views already on her Instagram account. Make sure you watch 'til the end! LOOK: Teen Heartthrob greets "Jennylyn" a Happy Valentines Day! Who is this teen heartthrob that greeted "Jennylyn" on Valentine's Day? He's no other than teen heartthrob Bret Jackson. Although it isn't clear who "Jennylyn" he's referring to, fans were quick to guess that it's Jennylyn Mercado as Bret has been very vocal about his admiration for the FHM's Sexiest for 2015. Sing along to "Bulalakaw" by Jennylyn Mercado featuring Sarkie of Silent Sanctuary! "Bulalakaw" is one of the tracks from the singer/actress's Gold record album 'Ultimate' under Ivory Music and Video. "Bulalakaw", aside from the carrier single "Hagdan" has been garnering strong streaming figures from music streaming platforms such as Spotify since the album's release. 'Ultimate' is still available in record bars and music stores nationwide. Also available for download and streaming across digital stores worldwide. WATCH: My Love From The Star cast serenades their Kapampangan fans! Ultimate Star Jennylyn Mercado and leading man Gil Cuerva brought joy and 'kilig' to their fans in Pampanga as they promoted their upcoming show, the Pinoy version of the hit Korean drama series My Love From The Star. Also present, were Gabby Eigenmann and Migo Adecer who are also part of the highly anticipated Kapuso series. My Love From The Star will air very soon on GMA Telebabad. LOOK: Fall in love with Tough Mama's Juicers and Blenders! How can you not fall in love with Tough Mama's line of juicers and blenders? 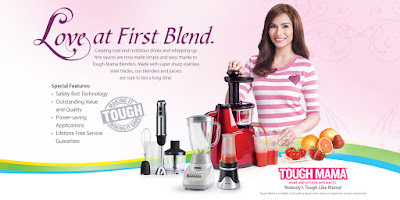 Jennylyn Mercado loves creating cool and nutritious drinks and whipping up fine sauces using Tough Mama's Juicers and Blenders which are made with super sharp stainless steel blades, an assurance of its durability. Get yours today at leading appliance stores nationwide and be a Tough Mama like Jennylyn. Join the cast of the much awaited Pinoy version of My Love From The Star lead by Jennylyn Mercado and Gil Cuerva at their mall show at Marquee Mall Angeles Pampanga this coming February 11, 2017, Saturday. See you there Kapuso!